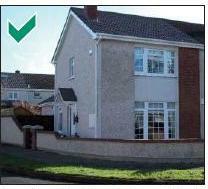 Declan Noonan & Associates have prepared this guide to provide advice on how to achieve a well designed extension. Our homes are the biggest investment many of us will make. Extensions are an effective way for homeowners to provide extra space without having to move house when their accommodation needs change. A well designed extension can personalise and enhance the appearance of the house as well as increasing the value of the property. There are many different ways of extending a house to create more space and it can be difficult to decide what the right approach is for your needs and your house. The main purpose of this guide is to set out an approach to designing an extension so that it will effectively meet the extra space needs of the homeowner and be a positive enhancement to the house and the area. Thinking About Extending Your House? Before starting to design a house extension or talking to an architect or designer, there are a number of basic questions to ask yourself and issues to think about. These will help you to define the type and size of the extension best suited to your needs and identify some options and constraints in relation to how you extend your house. 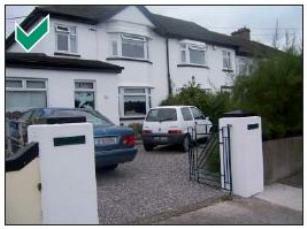 • Which direction does the house and rear garden mainly face – north, south, east or west? • How big are the side and rear garden areas? • Which direction does most sunlight come from? Are there sunny spots in the garden you enjoy sitting out in and want to keep? • Are there any underground sewers or overhead power lines or other services within the curtilage or immediately outside it that will need to be avoided? • Is the garden level? Is it higher or lower than the ground level of the neighbouring properties? • Where are the closest neighbouring properties in relation to your house and where are the nearest windows and doors in these neighbouring properties? • What type of site boundaries exist between the properties and along the street? • Are there any walls, fences or other structures that need to be kept? • Are there any significant trees, shrubs or hedges on the site that provide good shelter or are attractive that you want to keep? • What kind of rooms are needed, e.g. bedrooms, bigger kitchen, study room, storage etc? • How should the new rooms connect with existing rooms to be most useful? • Is it important that the new space can be easily adapted for other uses in the future if your needs change? e.g. converting a new ground floor study to a bedroom. • How much time do you spend in the garden? Do you want to retain a large private garden area at the rear? • Is it better to convert the attic into a room to meet your space requirements and minimise loss of garden? If so have you suffi cient space and height in the attic to convert it to a usable room and enough head height to install a staircase? • Is there a need to provide storage space for bins and bicycles? • How much space is needed for car parking within your house site? • Has the house been extended before? • What are the basic design features of the house, e.g. shape of windows, decorative features? • What materials is it built from? 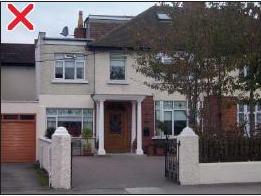 • Are there details of the original house that should be kept and used in the new extension, e.g. chimneys, window design, decorative details? • How have other properties in the street been extended? • Have you strong ideas about what the new extension should look like? • What energy efficient elements can be incorporated into the extension? 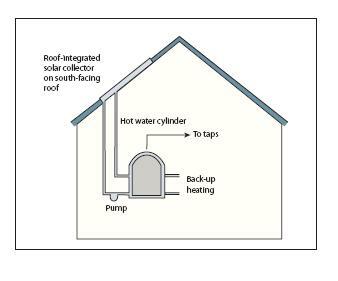 • How will extension be insulated, heated and cooled? • Are there other things that can be done to the house in conjunction with an extension – such as replacing a boiler or inserting solar panels? Working out the direction in which your house and garden areas face can help you plan a sunny, comfortable and energy efficient extension. The part of your house and garden that receives most sun during the day is probably facing south, while those parts that are in shade a lot of the time probably face north. The best way to check the direction is to inspect the position of your house and garden on an Ordnance Survey or other plan that includes a north point. The amount of light received through windows of a house will vary over the course of the year as the sun is at its highest point in the sky in the northern hemisphere on 21 June and at its lowest point on 21 December. It is best to ensure that at least some of the windows to habitable rooms that will get a lot of use, face within 90° of due south so they get reasonable light during the year. If this is not possible, perhaps because the only direction you can extend the house is to the north or east, then you should think about designing in roof lights or light wells to maximise the amount of light that can penetrate the rooms. Extensions are an effective way of personalising your house. Many different house styles can be seen across Ireland and there are numerous ways in which they can be extended to provide more space. It is not possible or appropriate to set out a small number of detailed design solutions that would suit all extensions. However, there are a number of basic elements that, if addressed during the design process, should result in an extension that is well-designed and respects the amenity of neighbouring properties. These elements reflect good practice and experience and supplement policies and advice in the local County Development Plan. The elements set out below need to be considered together as a whole when designing an extension to produce a high standard of design, neighbourliness and sustainability. For example, the position of windows in a new extension affect the daylight levels and the level of natural heat entering the rooms which will affect the enjoyment of the residents and their energy costs. BUT equally the position of windows should not impact on neighbours privacy. This section of the guide deals with each of the elements in turn and sets out best practice in addressing those elements when designing an extension as well as points to avoid. Examples of existing domestic extensions are illustrated throughout this document to highlight good and bad aspects of extension design. I: Respect the appearance and character of the house and the local area. Here at Declan Noonan & Associates we are keen to protect and improve the quality of the built environment of the County. With respect to domestic extensions, it expects a high standard of design that complements the scale and style of both the property being extended and others nearby. There is a variety of house styles ranging from modern semi-detached bungalows and two-storey houses to Victorian terraces to detached 1930s-style properties. Each dwelling requires a site specific response. Many extensions are designed to match the style and materials of the original house; however the Council does not wish to prevent innovation and is willing to consider creative and modern architectural approaches to design where they are of a high standard and is complementary to the house and its context. The site and the local area will have specific characteristics that need to be considered in the layout and design of the extension. The use of local materials or building styles will ensure the extension reflects local character. However the style of extension will influence how these are used. The extension should be in harmony with the surrounding landscape (be it urban or rural). So the design of the extension needs to consider the adjacent uses and how the extension will interact with neighbouring properties or open space. II: Provide comfortable inside space and useful outside space. Extensions are needed because the householder requires more internal living space. Giving adequate thought to the needs of the household at the outset of the design process as outlined in Section 3 of this Guide is important if the extension is to be comfortable to live in, relate well to the layout of the existing house, and be flexible enough to be adapted if the householder’s needs change in the future. It is also important that adequate external space is left for storage and for the use and enjoyment of the householders. √ Create generous sized rooms in a new extension with adequate storage. √Locate windows to the main living areas to face south as far as is practical to ensure that they receive sufficient light, or consider incorporating rooflights, lightwells or high level windows to allow more light penetration to rooms that will not get much direct light. √ Ensure that the house remains adequately ventilated, both existing areas and the extension. √ Design the layout of rooms and spaces so they can be adapted and used differently in the future if required. √Provide corridors and doorways that are wide enough to allow easy access through the ground floor and provide a level threshold or ramp at any external door. X Avoid designing habitable rooms that have no natural light or ventilation from windows. X Avoid creating unnecessary level differences between rooms that will require steps to be incorporated. √ Retain a reasonable amount of private garden area appropriate for the size of the house. The bigger the house, the more outside space is usually required. √ Provide storage space for bins and bicycles and if possible provide an external pedestrian access between the front and rear of the property to avoid having to take bicycles and bins through the house. Where there is no option but to store bins at the front of the property, provide adequate screening to minimise their visual impact. √ Where possible provide sufficient space between the flank walls of adjoining houses, including new extensions, to allow access for maintenance. √ Create opportunities for providing a sheltered and sunny south facing private patio area or sitting out area. √ Consider the impact of the extension on existing car parking arrangements. √ Provide an attractive, low maintenance boundary between neighbouring rear garden areas for privacy. √ Keep and protect existing trees and hedges where possible to provide visual interest, shelter and privacy and to accommodate wildlife. 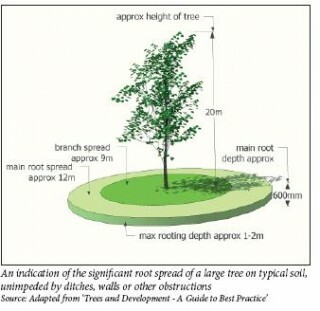 √ Provide new trees and shrubs to help soften the impact of a new extension. √ Protect trees and hedges to be retained with fencing during construction works to avoid accidental damage. 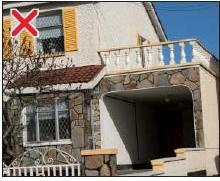 X Do not remove front boundary walls or railings, particularly if they are characteristic of the street or area. X Do not build within 3m of a sewer or watermain; or under an overhead power line crossing the site. Trees and shrubs are invaluable in urban gardens. Not only do they provide beauty and interest all year round, they also absorb carbon dioxide and give us oxygen to breathe, help filter dust and pollution from the atmosphere, provide privacy in gardens and shelter from the wind, and provide food for birds, insects and other wildlife. Mature trees and hedges in urban gardens should be retained where possible and protected from damage when constructing a new extension. If it is not practical to keep existing trees and hedges, consideration should be given to providing new planting and landscaping when construction works are finished. When selecting a new tree or hedge species for a garden, it is important to choose one that is suitable for the size of space available and the soil conditions in the garden. An unsuitable species could significantly reduce sunlight to adjoining houses (particularly if evergreen), create too much shade in the garden, require lots of maintenance and pruning to keep it in check, and in the case of gardens with heavy clay soils, vigorous roots could affect house foundations boundary walls and underground services. The use of native tree and hedge species is encouraged in the interest of enhancing diversity and providing suitable wildlife habitats. When choosing a new tree, check that the height it will ultimately grow to is suitable for the size of the garden, and that the species is suitable for the soil and climatic conditions. Remember that trees should not be planted too close to the house, boundary wall, or underground services to avoid damage to foundations, structures and pipe work from tree roots and storm damage. When choosing a new boundary hedge, choose a species that is suitable for the space available, and can be pruned easily to keep it at the appropriate height and width. Remember that conifer species such as Leyland and Lawson’s cypress are not suitable for many urban gardens as they grow quickly and will not tolerate hard pruning to keep them in check. Contact Declan Noonan & Associates for advice on tree and hedge species suitable for your particular garden size and soil condition. III: Do not overlook, overshadow or have an overbearing impact on neighbouring properties. Access to good levels of natural light and privacy is essential to people’s comfort and wellbeing in their homes. In designing an extension, it is important to ensure that not only do rooms in the new extension have good access to daylight and sunlight, but also that the extension itself through its location or height, will not significantly reduce the amount of daylight and sunlight enjoyed by neighbouring properties or severely overshadow them. Good levels of natural light are particularly important in the habitable rooms of a house such as kitchens, living rooms, conservatories and bedrooms as well as any private external patio or sitting-out area located to the rear of the house. As well as blocking out light to a neighbouring property, a poorly located and bulky extension can also feel oppressive or overbearing when experienced from adjoining residential properties. This effect can be magnified along a terrace of houses where a ‘tunnel effect’ can be created by a series of rear extensions. It is important that the occupants of both the new extension and neighbouring properties enjoy reasonable levels of privacy in their homes and gardens, and so careful consideration needs to be given to the location of new windows in an extension. The living conditions, or ‘amenity’, of neighbouring properties can be affected by a new extension being built. 1. Will it have an overbearing impact? 2. Will it significantly overshadow the neighbouring property? 3. Will it reduce privacy below reasonable levels? In considering these issues, it is important to take account of any significant changes in site level between neighbouring properties, and the orientation of the properties and proposed extension, as these factors may increase or decrease the overbearing or overshadowing impact. A well-designed extension will allow lots of natural light to penetrate but will not overshadow neighbouring properties. √ Locate extensions, particularly if higher than one storey, away from neighbouring property boundaries. As a rule of thumb, a separation distance of approximately 1m from a side boundary per 3m of height should be achieved. 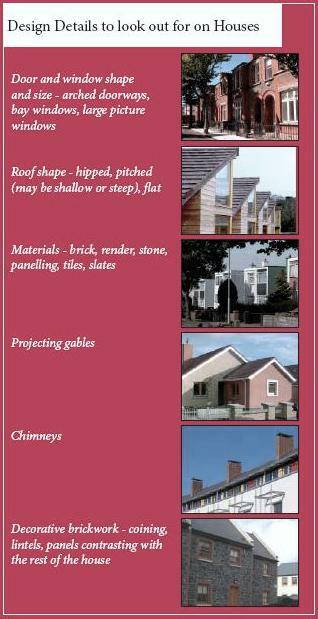 √ Use light coloured materials on elevations adjacent to neighbouring properties. X Two-storey extensions will not normally be accepted to the rear of terraced houses if likely to have an overbearing impact due to close spacing between houses. X Where a scheme of two-storey extensions is proposed to the rear of terraced properties, they should not normally protrude from the rear wall of the houses more than 1.5 times the distance of the gap between the extensions (‘tunnel effect’ diagram above right). √ Locate and design an extension so that it will not significantly increase the amount of shadow cast on the existing windows or doors to habitable rooms in neighbouring properties. √ Assess the impact of the shadow cast by extensions that are two-storey or higher on the daylight received by neighbouring properties. If the assessment demonstrates that the proposed extension will result in significant overshadowing or loss of light to habitable rooms in the adjoining dwelling, redesign to reduce impact. (‘Assessing the Shadowing Impacts’ see paragraph and diagram below). X Do not plant tree or shrub species such as evergreen conifers along party boundaries that will mature and grow so high or dense that they overshadow or block out light to the neighbouring properties. These models demonstrate how different scales and designs of extensions have the potential to cast varying degrees of shade. Shadow diagrams are best undertaken by a suitably qualified person. They are a useful way of assessing the impact of a new extension on neighbouring properties. The Council may request that shadow diagrams are submitted with planning applications for extensions of two-storeys or higher. Such diagrams should show firstly the pre-extension situation for both the application site and neighbouring properties (including any approved extensions or alterations that are not yet built), and secondly, the situation with the proposed extension in place. The shadow diagrams should illustrate the situation at 10.00am 12.00 midday and 2.00pm on 20th March. 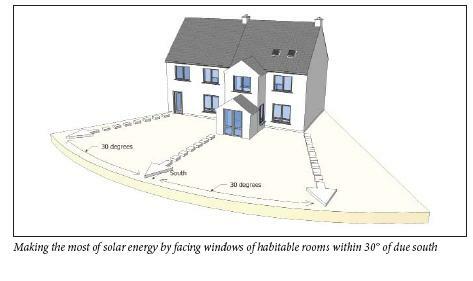 In order to avoid creating an adverse impact on the amount of light enjoyed by existing properties, a proposed extension should not reduce the amount of sunlight received by a main living room or garden or private amenity space in adjoining properties by more than 0.8 times their former values. – if the window is at ground floor level, provide a fence or wall to screen it. √ Provide frosted or opaque glass windows with restricted openings in bathrooms, halls and stairways. √ Design the extension layout so rooms that might overlook neighbouring properties are corridors / bathrooms / stairways etc. √ Arrange the internal layout of habitable rooms within an extension so that windows will allow a reasonable level of light into the rooms but won’t directly overlook windows to habitable rooms or the private patio or sitting-out area of neighbouring properties. √ As a rule of thumb, ensure there is at least 22m between directly opposing windows at first floor level in the rear elevation of properties. X Do not use opaque or frosted glass in windows to habitable rooms. • Do get your neighbour’s permission in advance if you need temporary access to their property in connection with the construction of an extension, e.g. to erect scaffolding or render the gable wall. • Remember that no part of an extension including foundations, gutters, drainage pipes, or eaves should cross, overhang or oversail the boundary with neighbouring properties unless the neighbours have given written agreement to such encroachment. • Consult with your neighbour at the earliest opportunity if any shared party wall might be affected by your extension proposals. The following guidance on visual design issues address some of the main types of house extensions. may be jarring on the same house. An urban street too may suffer from the cumulative effect of many different extensions that detract from the rhythm of the streetscape. √ A porch with a solid appearance (i.e. a greater proportion of brickwork or render to glazing) and a steeply pitched roof will usually be more appropriate for older houses and those of a more traditional design which have pitched roofs of 45° or more. √ A simple porch structure with a more lightweight appearance (i.e. a greater proportion of glazing to brickwork or render) and either a fl at roof or a shallow pitch of 30° or less will be appropriate for a modern house with either a flat or shallow pitch roof and strong horizontal lines e.g. wide windows. √ Where a house has an arched or other distinctly decorative entrance, it is best to design a porch structure that will enhance and reveal rather than obscure it. X Avoid the use of fussy decorative details and features not typical of the house. The jarring visual effect of a group of extensions to the side, roof and front of a house that do not complement original house or each other. A well designed front and side extension that reflects the character and design details of the original house. details of the main house, e.g. window location, shape, type, proportion and sill details. √ Reflect the roof shape and slope of the main house. √ Match or complement the materials used in the main house. √ Try to expose and complement rather than hide or cover original distinctive features of a house such as bay windows. √ Keep front boundary walls or railings, particularly if they are characteristic of the street or area. √ Try to maintain a minimum driveway length of 6m. √ Where an integrated garage is to be incorporated into an extension, doors should be recessed by at least 30-50cm from the front wall of the extension and the garage door designed to include vertical elements. X Avoid extensions that are dominant or overlarge in relation to the scale and appearance of the house. design of the original house. X Avoid building an extension more than 1.5m in front of the existing front wall of the house if there is a regular building line along the street. A good example of ‘turning the corner’; a side extension on a corner plot that avoids creating blank elevations. • if the house is detached or on a large site or in a prominent location such as the corner of a street, it may be appropriate to consider making a strong architectural statement with the extension. √ Match or complement the style, materials and details of the main house unless there are good architectural reasons for doing otherwise. Where the style and materials do not seamlessly match the main house, it is best to recess a side extension by at least 50cm to mark the change. √ Leave a gap of at least 1m between the extension and the side party boundary with the adjoining property to avoid creating a terraced effect. A larger gap may be required if that is typical between properties along the street. √ If no gap can be retained, try to recess side extensions back from the front building line of the main house by at least 50cm and have a lower roof eaves and ridge line to minimise the terracing effect. In the case of a first floor extension over an existing garage or car port that is flush with the building line of the main house, the first floor extension should be recessed by at least 50cm. √ Match the roof shape and slope of the existing house. In the case of houses with hipped roofs it can be particularly difficult to continue the ridge line and roof shape; however it is more visually pleasing to do so if this will not result in a terracing effect with the adjoining house. √ Where the extension is to the side of a house on a corner plot, it should be designed to take into account that it will be visible from the front and side. The use of blank elevations will be unacceptable and a privacy strip behind a low wall, hedge or railings should be provided along those sections of the extension that are close to the public pavement or road. X Avoid creating a terraced effect and awkward join between the rooflines of two adjacent properties if building up to the party boundary. X Do not include a fl at roof to a prominent extension unless there is good design or an architectural reason for doing so. X Do not incorporate blank gable walls where extensions face onto public footpaths and roads. X The use of a ‘false’ roof to hide a flat roofed extension is rarely successful, particularly if visible from the side. X Avoid locating unsightly pipework on side elevations that are visible from public view. Consider disguising or recessing the pipework if possible. X Extending a hipped roof to the side to create a gabled end or half-hip will rarely be acceptable, particularly if the hipped roof is visually prominent and typical of other houses along the street. X Avoid the use of prominent parapet walls to the top of side extensions. V: Use of renewable resources and energy and water saving measures. fuel needed for heating the house, thus saving money. • Providing high levels of insulation will save money on heating costs and result in comfortable living conditions. • Locally sourced, natural or suitable recycled materials should cost less as transport costs are reduced. • Low-energy light bulbs save energy costs and dual flush toilets will conserve water. due south or within 30° of due south to make the most of solar gain. √ Provide roof overhangs, eaves or projections above large south-facing windows to provide shade and avoid excessive heat gains from summer sun. √ Think about providing an unheated sunroom or conservatory on the southern elevation. √ Minimise window openings on north-facing walls to reduce heat loss. solar collectors or panels to it. 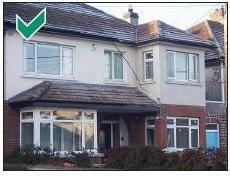 √ As a minimum, ensure that the extension is insulated to the standard required under the Building Regulations. Higher levels of insulation will yield considerable savings over time. √ Use locally sourced building materials from renewable resources where possible. √ Use building materials that are durable, recyclable and environmentally friendly. √ Provide natural controllable ventilation to all rooms to provide fresh air and remove moisture, odour and pollutants. √ Use windows that have a high resistance to heat loss and ‘low emissivity’ double glazing which has a special coating to reduce heat loss. √ Use thermostatic radiator valves that allow temperatures to be controlled in individual rooms. √ Choose energy efficient lightbulbs and fittings for room where lights are likely to be switched on for long periods. √ Retain and protect any existing trees and shrubs on the site – they will provide shelter from the wind and a haven for birds and wildlife, particularly in urban areas. √ Minimise the use of concrete, tarmac or other hard surfaces for car parking to a minimum. Consider the use of gravel, sedum plants, permeable paving or other permeable surfaces instead. X Avoid locating large windows to habitable rooms on north-facing walls if possible. X Avoid poorly designed or excessive ventilation which can cause draughts and waste heat. X Avoid using tropical hardwoods and other materials from non-renewable sources. X Avoid covering large areas of the front or rear garden with hard impermeable surfaces such as concrete which will reduce natural drainage on the site. X Avoid undertaking construction work at nesting times if there are birds or bats nesting in the house or garden. For more information on energy management click here. A Building Energy Rating (B.E.R.) is an indication of the energy performance of a home. It covers energy use for space heating, water heating, ventilation and lighting calculated on the basis of standard occupancy. A BER is similar to the energy label for a household electrical appliance like your fridge. The label has a scale of A-G. A-rated homes are the most energy efficient and will tend to have the lowest energy bills. Click here for more information on BER and our BER Assessment Service. Many house extensions require planning permission. However, there are certain exceptions to this known as ‘exempted development’, which can be constructed without planning permission. An extension can be constructed as exempted development and without planning permission provided it complies with all of the relevant criteria and thresholds. If it doesn’t comply with the criteria, then planning permission is required. 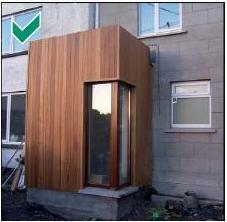 Declan Noonan & Associates have been dealing with the planning authorities for many years. Our vast experience and training means that we are familiar with the trends and styles that are in favour with the planning authorities. Our record of getting planning permission granted for different projects is exemplary. And on the very rare occasion that we do get a refusal, we see this merely as a hurdle to jump along the way in getting you planning permission. Through negotiation, revision and effective communication with the planning authority often those refusals can be overturned. Here is a link to some of the most frequently asked questions we hear from our clients.